The practice of taking a mugshot after a person’s arrest began in the mid-1840s. Law enforcement used the pictures for record keeping and to aid investigations. The Los Angeles DUI community has seen some pretty outrageous mugshots come through over the years. • Batman didn’t stop this Joker in time. Offers arrested Dennis Lalime after he crashed his car in Maine. Lalime was wearing a Joker costume from a Halloween party at the time of his arrest. His mug shot featured bright green hair, side burns, and mustache. On top of the white face paint, he did remember to wear his glasses. • What do you call someone who isn’t fully committed to No-Shave-November? A DUI mugshot of a 28-year-old from Pennsylvania divides his face into shaved and not shaved halves. Luckily, his head hair seems untouched. • I mustache you a question, sir. Is the tattoo of your handlebar mustache and soul patch permanent? Christopher Gerhart’s mugshot features what appears to be Sharpie-drawn facial hair. He claimed it was only temporary. Regardless, the mugshot and his record will remain. • Surprise! Andrei Bibbs’ DUI mugshot makes him look very surprised. Bulging eyes and an open mouth highlight his shocked expression. We may never know what really surprised him, but we’re pretty sure it wasn’t the DUI charges brought against him. 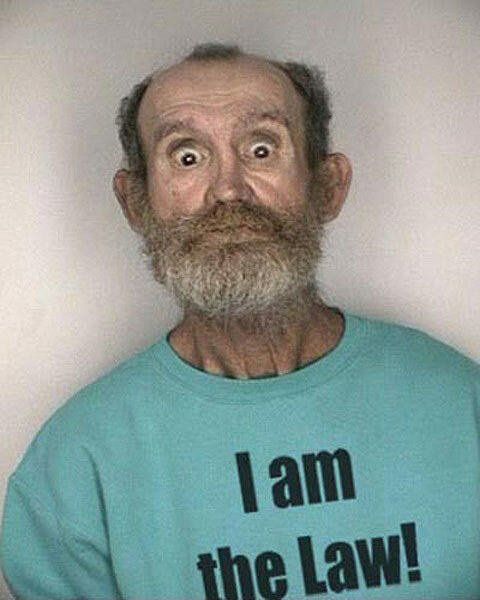 Funny, unexpected, and outrageous mugshots add levity to otherwise serious cases in the news. Remember that the public has access to your mug shots and arrest information.